Pepe called on Dec. 27th with the following dispatch: "Michael and I went up to the hut on Chimborazo and encountered the first cloudy weather of the trip. When it cleared partially, we inspected the route and found that is was very icy and that there was too much rock fall. Together we decided it was best to not make the climb. So we headed to Baños to enjoy the hot springs. This is a warmer climate. The town is on a river which cuts one of the routes down to the Amazon. It's a warmer climate here and very nice. 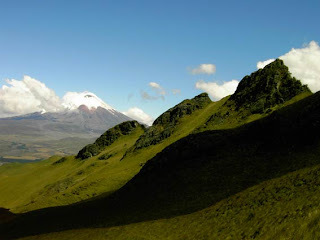 Today [Thursday] we are going to drive back to Quito and possibly climb Rucu Pichina in the afternoon or Friday morning. We are sorry not to try Chimborazo, but we are very happy to have succeed on two of our three goals. We are definitely having a good time! It has been very beautiful in Baños. That's all the news for now except that we are eating very well.."
"Hi, this is Pepe calling from Ecuador! Today Michael and I climbed Cotopaxi. We had a really nice climb the weather was spectacular and conditions were ideal for climbing. We left camp at 1 and made it to the summit at 4:30, so it was a very, very good time, very, very fast. Only 3.5 hours to the summit. We got down in one hour, and now we are enjoying the Hacienda Cienega. I love this old colonial hacienda! I never get tired of coming here. Michael is enjoying it too, it's a wonderful place for resting today after an early morning climb. Tomorrow we are going to leave at ten to drive to the Chimborazo National Reserve. We are tired and are going to rest, but tomorrow we are excited to be going to the south. Climbing Chimborazo will be an excellent finish for this already highly successful trip." Pepe called with this dispatch Sunday morning, December 23. “Hello again from Ecuador. After our success on Cayambe, we are taking a couple of days to rest and relax. We are based at Tambopaxi Lodge, and from here we have a clear view of majestic 19,248-foot Cotopaxi, our next goal. We are going to do a little hike today to a lake with great views of Cotopaxi, and late in the afternoon we will move to Jose Ribas hut at the base of the climbing route. Again we we have a midnight wake-up call and a 1am departure for the summit. The weather continues to be excellent. We have clear skies today and last night there was a fairly full moon. That will be handy in our ascent. If it is clear, we probably won’t need to use of headlamps! “Hi again. This is Pepe calling to let you know that we succeeded in climbing Cayambe! We started climbing 1AM this morning and made good time all the way up the route. We arrived at the summit at 7AM. The weather has cooperated beautifully for us, and the conditions for cramponing were excellent. We’re back at the hut resting and having some things to eat and soon we will be leaving and heading down to Hacienda Guachala. “Hi – This is Pepe calling from Ecuador again. Yesterday [Monday] we climbed Guagua Pichincha (15,670 ft /4,775 m). The weather continued to be excellent, and all day it was clear and sunny. Really perfect! It was possible to see into the crater of Guagua – and that is not a common thing. Usually it is choked up with clouds – they just gather there and hang in it. But today we had great views and we could see smoking fumaroles – we got some great photos of it. After climbing Guagua Pichincha we headed north to an area near the base of Cayambe, which will be our first major summit. Our base is Hacienda Guachala, a beautiful place where it’s easy to get a good rest and enjoy excellent food. Tomorrow after a late breakfast, we will drive up to the hut on Cayambe, leaving at about 10:00 am. It will be another perfect step in acclimatization. The big local news is that the volcano Tungurahua is erupting again. It is well to the south, but I think we may see some ash during our climb because the winds are south to north. It was quiet for quite a few months, but it’s getting busy again. Our main hope is that the ash doesn’t blow to the west and give a new coat to Chimborazo. That mountain needs to keep the snow and ice that it has, and whenever there is an ash deposit, it speeds up the melting because the dark ash absorbs a lot of energy. So we’re keeping our fingers crossed. Today [Tuesday] we drove to the Cayambe hut and then hiked higher up to about 16,000 feet or 49000 meters. We went to the edge of the glacier and enjoyed the views and gained the benefit of being a little higher briefly to continue our gradual acclimatization. It was a very nice hike on a beautiful day! Tonight we had Chinese food for dinner with great vegetables, delicious sauce, rice, and a little meat. Peaches were our desert – very refreshing! This is Pepe calling again. Today Michael and I climbed 13,776 - foot Pasochoa. The weather was just perfect. Everything was clear – Cotopaxi. Cayambe, Antisana — and we had spectacular views. Michael is very, very fit! Usually this hike takes 4.5 - 5 hours, but with Michael it took less than 3 hours. So we came back very early and had lunch just as we came off the peak. Because of the speed we had extra time, so in the afternoon we went to a hot springs where we enjoyed a pretty scene and relaxing hot springs at different temperatures. What a great follow-up to a hike or climb! “This is Pepe calling from Ecuador with the first dispatch for the Ecuador Volcanoes expedition with Michael Radin. 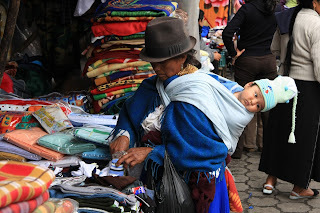 Today we went to the Otavalo Market north of Quito. 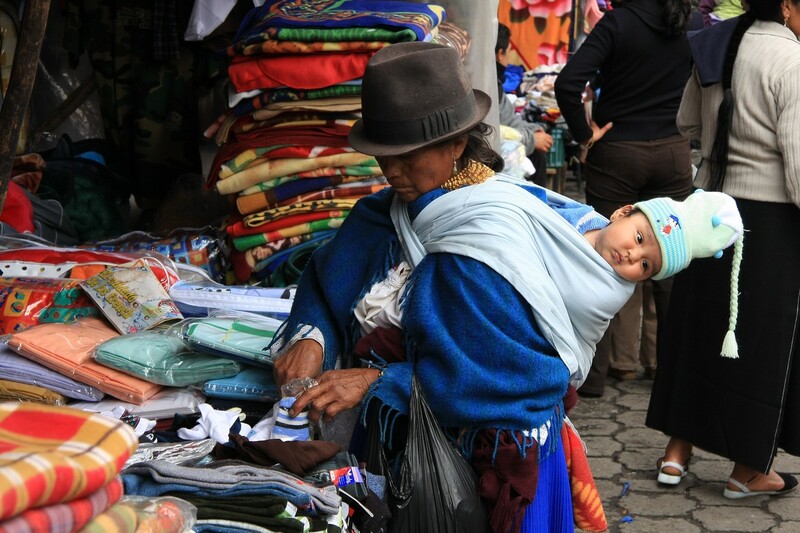 We enjoyed exploring the market and its huge range of products for sale – some for tourists but lots of things for the indigenous peoples of the surrounding countryside. We had lunch there and then visited lake Cuicocha. The weather was perfect, and from a high ridge above the lake we got great views of Cayambe, Cotopaxi and Antisana. Michael was very happy and took lots of photos of the mountains. The atmosphere was really, really clear, and the mountains just seemed to jump out at us. I think the people on the mountain summits were very happy!